Nick and I discussed our build options. My only request is a CLEAN Design. I've seen so many Franken Tall Bikes, which is fine, but I want something clean and "well" thought out. "Well thought out" being completely subjective. Of course most Tall Bikes are a mix match of spare parts, junk frames and etc. To some degree, that's what makes Tall Bikes so wonderful. Re-Cycling. The plan now is to knock off the bottom bike's top tube and both bikes head tubes. We will then weld a new longer top tube. 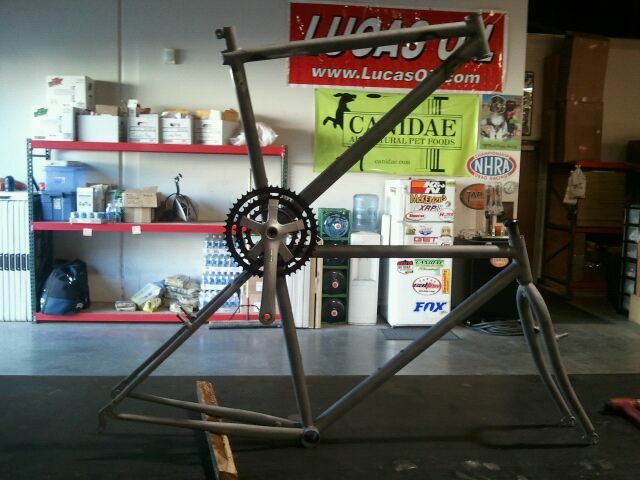 Nick did a quick tack at the bottom bracket and seatpost to get a visual.